The warm summer air on the back of your neck. The soothing and rhythmic chirping of crickets in sticky grass. These memories or calls can reach into the recesses of anyone's mind and drag forth aching nostalgia. Picturesque moments from your past, or present, with vivid colors play forth like movies in your mind, as you drown in the atmosphere around you. American Football's self-titled album brings this forward. The highly influential album from 1999, was the band's only full-length, and while in total they only ever released 12 songs, the group left a massive lasting impression on indie music. 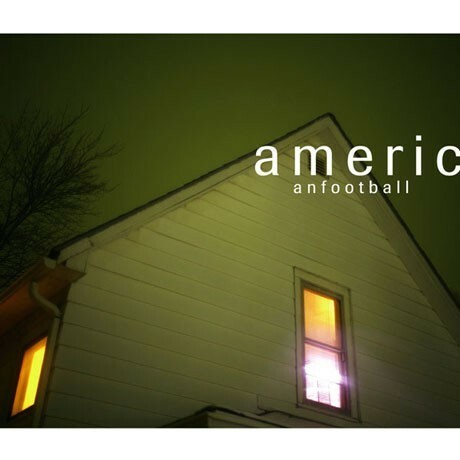 American Football is an album that can be played on repeat, throughout your life. There is not a single song that falls short of excellence, and no dull moment exists. The music is one of the unique and unrepeatable defying moments in modern indie rock, and has set an unreachable bar for bands to try to replicate. The recent reunion of the band, has lead to a deluxe reissue of the classic album, complete with the original LP and a bonus disc of unreleased demos and live tracks. For this review, I will first start with the album itself, and then proceed to the bonus disc. American Football opens with one of the most emotional and important songs for anyone who has ever enjoyed "emo" music. "Never Meant" does not only have the delicate lyric content that tugs at ones heartstrings, but it is supported by the jazz-influenced noodling guitar that has defined the genre since then. Coupled with drums that stand on their own besides anything else, you get a track that is a staple for any romantic's catalogue. The duel guitar work, by singer Mike Kinsella and guitarist Steve Holmes, is mesmerizing and hypnotic. Time signatures and tunings vary from song to song and while the entire album has a immensely concise tone, each individual track stands out on its own. Backed by the often underrated drumming of Steve Lamos, the band is still one of the most organic sounding units to record. The intermittent trumpet that graces a handful of tracks, eases itself in and is never used as a crutch or a gimmick. These soft, small unexpected moments are intimate and calming, and even though the album never reaches any speeds past "moderate," the slower tracks are the most inviting and warm. "The Summer Ends" drips with the bittersweet happiness/sadness of August, where Kinsella's lyrics are brutally relatable. "Honestly?" begins with one of the greatest "bass" lines ever (bass is in quotes because most tracks of the album do not feature bass, but just guitars tuned down). The driving line builds with call and answer vocal lines that blend perfectly with the music, only to crash and explode into the extended outro, where Lamos' drums come forth and flourish. Many times throughout the record ("But The Regrets Are Killing Me" for example) the guitar tones transcend into unexplored territory. Warm notes and intertwining riffs intersect and create beautiful monuments of sounds. All of this with Kinsella's simple, yet honest lyrics and vocals overlaid. There are an uncountable amount of moments like this on the album, and it is truly a modern masterpiece of music. The bonus disc of the deluxe edition bring us long lost demo recordings and live tracks from the band. The subtle tape hiss present adds to the nostalgic tone of the music, and the unreleased demo songs sound perfectly encapsulated in the time period. The live track "The 7's" is a building, lengthly instrumental that would've been a great addition to the LP, but was cut due to time constraints. Many songs from the LP are found again here, as practice rehearsal demos from the production sessions. These rougher edits showcase what the songs would've sounded like live during the band's existence. The entirety of the extra disc is intriguing, and while it may not be listened to as much as the album, it deserves subsequent revisitations. The only thing missing from the deluxe edition is the inclusion of the three tracks from their only other release, the also self-titled EP (although we do get a live version of "Five Silent Miles"). This is just a minor exclusion and for long time fans of the band won't be a bother at all. The live tracks and demo recordings are a treat and a long-awaited surprise to many, and round out a wonderful deluxe reissue of a modern classic album.